Traveling with young kids can be exhausting, stressful and, let’s face it, not always fun for the parent. Instead of cultural treats, day-time activities often involve excursions to the zoo, children’s museums, nearby amusement parks or a trip to the nearest outdoor playground. And traveling light? Forget about it. Even if you are lucky enough to have ditched the diaper bag, chances are there are still drinks, snacks, extra clothes and strollers to contend with. But not all kiddie-related travel is doom and gloom. In November I had the rare experience of going on a mommy-and-me vacation with my eldest child and I seized the opportunity to plan two amazing sight-seeing trips for my adventurous six year old. One was to London and the other to Paris. In my experience, six year olds are a pretty independent bunch. They crave to be treated like big kids and that means no strollers. But the reality is your mini me only has little legs and these legs will get tired after a mile or so of walking. So, if you have a lot of ground that you want to cover, you may want to invest in a Razor kick scooter and carry bag. For $30 (or in my case £19.99) this gift is one that will keep on giving. 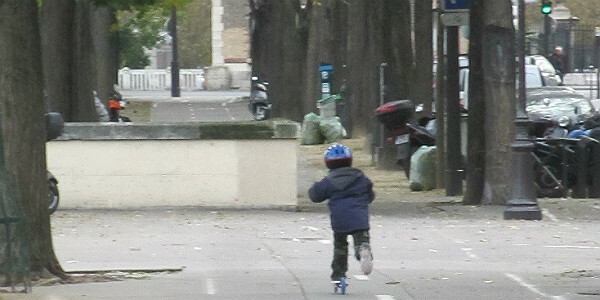 On his first day in Paris my son easily handled a 3 mile scoot from our hotel to Notre Dame; followed by yet more scooting to dinner and between Metro stations afterward. If you are planning to do a lot of walking and/or sight-seeing, make sure you build in some play time to break up the day and allow your child to let off some steam. Online satellite map tools are an easy way to identify playgrounds close to your chosen point of interest. For instance we went to an amazing ecological park just down the road from the London Eye (you can actually see it when you are in the Ferris Wheel). In Paris, we enjoyed playgrounds along the river Seine, as well as the little play area at the back of Notre Dame itself. It may cost a little extra but, instead of stuffing a packet of Pepperidge Farms goldfish into your handbag, why not try and soak up some local culinary treats for snack time. Not only is it a cultural experience in and of itself, but it will give your child some extra energy so that they can keep on seeing the sights. The many street cafés of Paris are perfect for hot chocolate pit stops (not to mention a welcome refuge from the chilly November air), and the local boulangeries offer treats galore. Sure, every 6 year old is going to enjoy an elevator ride up the Eiffel Tower. But what about Tower Bridge in London? Did you know that, while the Tower Bridge does a great job of including kids by offering them a passport book and encouraging them to seek out sticker stations, it does not provide the necessary foot stools needed for your child to see out of the walkway windows? This makes it very boring for younger visitors and, reciprocally, means you will have limited time to read the information exhibits along the way. (However it has to be said that the interactive science displays in the Engine Room were great). Long story, short, it is important to do your research. Find out about the attraction before you buy your ticket. It maybe that your child will have more fun playing chase in the Tuileries gardens bordering Le Louvre than walking through the art galleries themselves. Just like the refueling pit stops, how you get somewhere can also be a unique experience in and of itself. Catch a train, take a bus, hail a taxi, ride a cable car, or even climb aboard a boat. 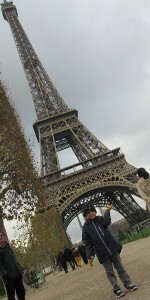 My two day trip to Paris included taking the London Underground and then the Eurostar. We also rode countless Metro trains, and even caught the Batobus on the Seine to get to and from a couple of attractions. For my six year old each experience was an adventure. Build up anticipation before your visit. Find out what attractions most interest your child and talk about them before you even catch your plane. And, if there is another attraction that you want to see, schedule that visit first. It will encourage good behavior in the lead up to the main event.